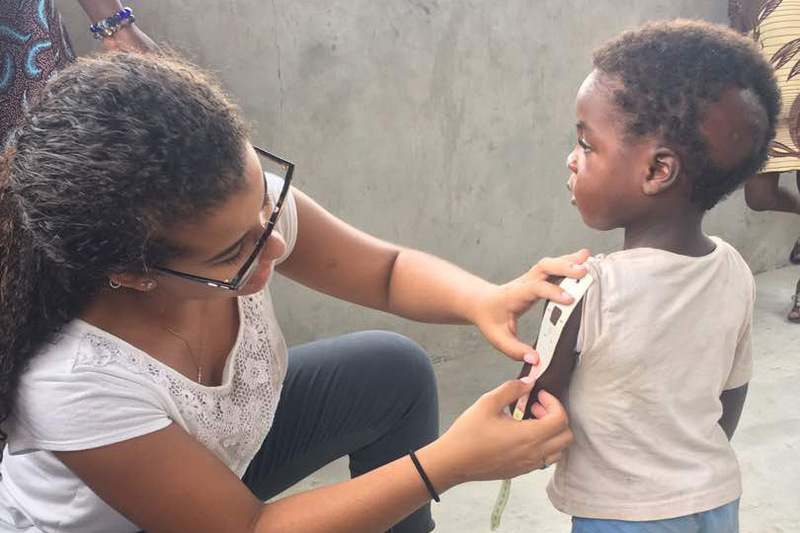 RIT student Olivia Garror assesses a child for malnutrition in a refugee camp in Ghana. As a graduate student in Ghana, Brenda Abu witnessed the toll of anemia, a condition that afflicts as many as 70 percent of the children and 45 percent of the women in that West African nation. Her experiences convinced Abu to pursue a career researching nutrition, specifically looking for ways to reduce anemia in mothers and their children. Now as a post-doctoral fellow at RIT, she has developed a program that capitalizes on the university’s goal of offering more global and experiential learning experience for its undergraduates. “We bounced the idea back and forth until it became something that would help students to get experience in the process of designing and conducting international research,” said Abu, who is a fellow in the Wegmans School of Health and Nutrition. 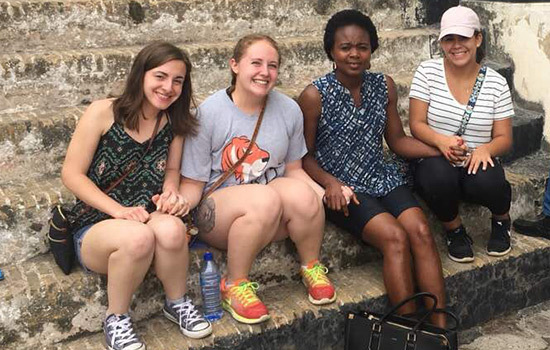 It’s the first global research experience to be offered by RIT’s Wegmans School of Health and Nutrition, and there are plans to apply what the students learned back in Ghana and elsewhere in the world, including Rochester. Anemia is sometimes called the “hidden hunger.” It creeps up slowly, causing severe fatigue. But it can also affect the heart, cause pregnancy complications and stunt children’s physical and mental development. Unchecked, it causes chronic illness, even death. The causes vary: poor diet, genetics, malaria and diarrheal infections contracted from pathogens in dirty water—all factors that deplete the body of necessary nutrients, especially iron, and weaken the immune system. Full blown anemia is slow to develop, and early signs of the micronutrient deficiency—pale eyes and palms of the hand—can be easily missed, even by a trained eye. What Abu is trying to do is better understand all the factors—such as food choices, social programs, health and sanitation—that contribute to anemia and find ways to make them less of a factor and reduce the likelihood of the condition. She launched her program with a fact-finding mission in which she and three undergraduate students spent two weeks traversing Ghana. Using a grant from RIT’s Paul and Francena Miller Chair in support of International Experiential Learning, they crisscrossed the country, interviewing agency and program staff who work with the Ghanaian community to resolve anemia, as well as leaders of governmental and non-governmental programs. They spent time with a mother whose child suffers from anemia, and met with a midwife who is respected and influential in her community. Abu took her team to open-air markets to see what food is sold, and how it is handled and stored in the heat. They traveled to a remote village built on stilts over a lake, and to three refugee camps. Abu and her students visited the Buduburam refugee camp in the central region, west of the capital Accra, and then to the remote Ampain and Krisan camps in the western region. Buduburam is the larger camp with more than 42,000 refugees, mostly from Liberia. The smaller camps in the Ellembell District in the western region shelter immigrants from Liberia, Sierra Leon, the Ivory Coast, Sudan and Rwanda, and countries as far as Pakistan. The student team—Olivia Garror, a third-year biomedical sciences major from Bainbridge, N.Y., and fourth-year nutrition management students Nicole Buttner from Schenectady, N.Y., and Rachel Stefanic from Raleigh, N.C.—learned how food is managed in the camps, and at one camp, assessed the children for malnutrition. Buttner said she was fascinated by the stilt village. Abu said the students asked a lot of questions about the country and the culture. Barbara Lohse, director of the Wegmans School, said such experiential learning experiences are invaluable and can open up a whole new world perspective for students. Abu said the purpose of the trip was “not an intervention, but learning what they can do in this area, as RIT, as young people in nutrition.” Abu envisions a holistic approach that includes public health programs and other sectors that aim to prevent the problem through different means—fortified foods, agricultural projects, financial programs to help families improve their income and access to clean water and sanitation services. Each contributes to building resilience against undernourishment and disease. Abu is already applying what was learned on the trip. She and Lohse have developed the curriculum for a new stand-alone course, Global Food and Nutrition Perspectives, which Abu will teach during the spring semester. And they are planning to add future study-abroad components to complement the classroom work. Through a collaboration with colleagues in the College of Liberal Arts, Abu also is contributing to a local nutrition-education project for young mothers in Rochester’s inner city. She says sharing nutrition research with the people who need it is her calling. RIT students gained global research experience on a trip to Ghana through the Wegmans School of Health and Nutrition. 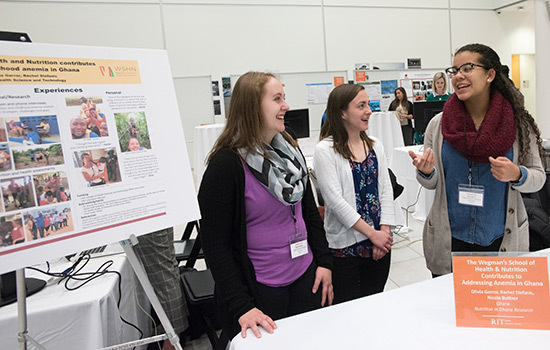 Seated left to right are Nicole Buttner and Rachel Stefanic, nutrition management majors, post-doctoral fellow Brenda Abu and Olivia Garror, a biomedical sciences student.